New Year’s Resolutions often include eating healthier, exercising more, saving money, getting more “me” time, and staying connected with family and friends. Have you considered adding an annual hearing test to your resolutions this year? Taking care of your hearing health is more important than you might realize. Untreated hearing loss leads to a cascade of other health issues, and affects your emotional, mental, and physical wellbeing. According to the American Association of Retired Persons or AARP, more people report getting an annual colonoscopy test than a hearing test! Untreated hearing loss has been linked to an increased risk of dementia, falls, heart issues, sleep apnea and high blood pressure. It’s not just physical health that is affected. People with untreated hearing loss tend to isolate themselves rather than face the challenges of not being able hear. This leads to depression and can even be the harbinger of suicide. So why aren’t people taking their hearing loss seriously? Living with untreated hearing loss also impacts your earning power and promotional status. If you can’t hear instructions for a project at work, or miss an important piece of information, your performance will suffer. If you can’t comprehend speakers at a conference or meeting, your attention will wander, and your boss and co-workers will have the perception you just don’t care about work anymore. You’ll be overlooked for promotion, or even risk your job. Hearing loss is often associated with being old, and our “stay young” society still attaches a stigma to hearing loss in older adults. But hearing loss can affect people of any age, whether from exposure to excessive noise levels, or as a result of aging. About 12.5% of American children between the ages of 6 and 19 have had their hearing permanently damaged from overexposure to loud noise. Baby boomers had their rock concerts and millennials have their earbuds. More than 14% of American adults between the ages of 45 and 65 have some type of hearing loss and between 30 and 40% of Americans over the age of 65 have some hearing loss. Nearly two-thirds of Americans over the age of 75 have hearing loss. Sadly, only 20 to 30% of adults who could benefit from hearing aids actually get them. The average older adult waits 7 to 10 years before getting their hearing loss treated, even if they know they have hearing loss. This makes the problem worse, and the longer a person has uncorrected hearing loss, the greater the damage to quality of life. Are you asking people to repeat themselves more often? Have friends and family mentioned you seem to be hard of hearing? Is it easier to hear someone if they are standing directly in front of you? Are you having a hard time determining where sounds are coming from? Is it difficult to participate in a conversation if you are in a loud, noisy environment? If you’re having problems carrying on a conversation and hearing the server at a restaurant, or feel like sounds are muffled, you have hearing loss. If you are having more frequent episodes of ringing in your ears, struggle to have a phone conversation, or turn up the television louder than others find comfortable, you have hearing loss. Answering yes to two or more of these questions means you need a hearing test. Hearing devices can’t go to the gym for you, but they will combat professional and personal issues that you are facing because of untreated hearing loss. Hearing aids improve your brain function and they will help with your overall health. Call Roseville Diagnostic Hearing Center today and schedule a hearing test. Even if you think you don’t have hearing loss, you need to be proactive with your hearing health. Hearing loss due to aging is gradual, so baseline testing will help you monitor your hearing, and stay healthy. 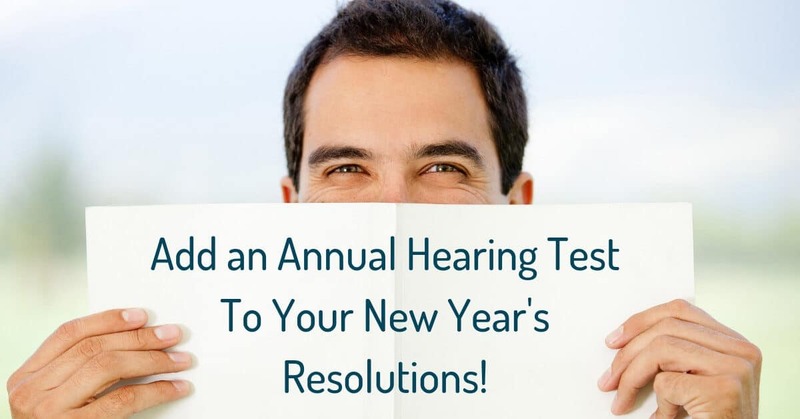 Let your newest resolution be to test your hearing, and let the professionals at Roseville Diagnostic Hearing Center keep you on the path to hearing health!